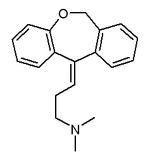 Doxepin inhibits the reuptake of serotonin and noradrenaline from the synaptic cleft (dual action). The reuptake-inhibition of dopamine is very weak. These effects account for the actions as well for most side-effects (sedation, hypotension, anticholinergic side-effects, massive weight gain). Doxepin shows strong antagonism against the effects of Reserpin (amine depletion) in the animal model. Like other 'classical' antidepressants it has a sodium channel blocking activity, possibly accounting for its analgesic action. Additionally, Doxepin exerts a strong local-anesthetic action. Peak plasma levels are seen 2 to 3 hours after oral dosing. Human : Not exactly known, clinical experience indicates a rather high acute toxicity, as is the case with other tri-/tetracyclics. Fatal dose in sensitive adults may be as low as 500 to 1,000mg oral (7 to 14mg/kg). In children below 12 yrs. of age any oral intake is to be considered as serious. Approved uses may vary by country. In the United States, the only FDA approved use of doxepin is the treatment of depression. All other uses should be considered off-label. Gastrointestinal ulceration and other GI-problems (e.g. irritable bowel syndrome), whether part of depression or not. The action is due to strong H2-receptor antagonism. The efficiacy is comparable to H2-Receptor-Inhibitors. What is the role of tacrolimus and pimecrolimus in atopic dermatitis?